It's spring. Time to get going, shrug off the down coats, for now anyway. If, as the poet claims, April is the cruelest month, he didn't live here in March, when our temperatures are tumultuous, tempting us sleeveless one day and forcing us to be fleece-wrapped the next. To straddle the season, just go with the grain. 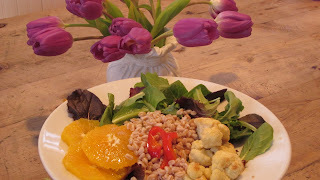 Farro that is. It's the stuff of Tuscan soups, stews and salads that has inspired Italian arias and frescos for centuries. It grows well in our region and our growers are rotating it in to their fields. You'll now find it in the bulk sections of our co-ops. It tastes a little like wheat berries a little like barley but it cooks up as quickly as pasta. Loaded with nutrients, high in protein and low in fat, it is great as a side dish and shines center plate. Arrange the greens, farro, oranges, chickpeas and cauliflower on a plate. Put the ingredients for the dressing into a small jar with a lid. Cover and shake vigorously. Taste and adjust the seasonings. Drizzle over the composed salad and season again before serving. Especially this time of year, when the cauliflower is coming in from California and is (like us) a little weary, roasting is one way to enrich it's warm nutty quality. It's easy and quick and will keep for several days. I like to serve if first night as a side dish, then use the leftovers tossed into pasta or hot farro with sauteed onions, chopped parsley and a little cheese. It's also wonderful in salads of farro or other grains. Preheat the oven to 400 degrees F. In a large bowl, toss the florets with the oil to coat. Sprinkle with the salt. Spread the cauliflower out on a baking sheet so none of the florets touch. Roast until golden and tender, about 15 to 25 minutes, shaking the pan and turning the florets about half way through. Serve warm or at room temperature.